Compare home warranty policies from the top ten home warranty service providers in Georgia. To further assist you in selecting your policy, we have created a graph with a bell curve that showcases the average price of premium and average deductible of the various home warranty policies that are purchased throughout the state of Georgia. View more... The X-axis indicates the price of the premium while the Y-axis indicates the number of homeowners. The start of the curve indicates the number of homeowners who purchase policies that have low premiums. The curve then rises to indicate the number of homeowners who have opted for the average premium and finally dips to denote the number of homeowners who opt for policies with a high premium. The Average Premium of the Georgia is mentioned at the top of the graph. Review: We have had them since 1994 when we purchased our home. And we have had nothing but great service. Repairs and replacements over the years. Review: The contractor sent to work on my A/C unit was efficient, timely and courteous. I had an additional problem only about one week later and they came out to resolve it as well. I use the online service process and it works quickly. The entire process is very efficient and not a great interruption to my day since I work from home. Review: I am just glad that my air conditioner did not go out during high temps and high humidity. I had to wait about a week to week and a half for the part to come in. Great service when it finally came. Initially I called to say I had my yearly service and they said I needed Freon. The Home Warranty sent their own people out and I paid my deductible and he actually found specifically where the leak was. Expensive repair despite having home warranty but worth it to be cool. Review: I have not been with AHS very long, but I am not impressed so far. They have speedy response time, but the contractors (so far) have been adequate. My primary complaint with AHS is their complete lack of customer care. Yes, the process of going onto their website & submitting a ticket--no problem. But, if you have issues afterwards & desire to speak to an actual human being--that will be the tricky part. Regardless of what time you call them, your average wait time will be 1 hour before someone starts actually talking to you. I recently tried late at night so that I could be on hold as long as necessary. --58 minutes. AHS needs to focus on their aftercare & communicate better with their customers. Review: It's seem on small ticket items they(AHS) will send several contractors out if it for a small ticket order. I've experienced a very poor service when I called for my a/c unit the first contractor wanted me to pay first before even looking at the unit, when I gave him $100 bill he said he couldn't take large bills and wanted me to give him my credit card and they don't take checks,and then he began to call Joe? I took my card back and told him I didn't feel comfortable about giving my card to a third party over the ph. Ahs sent out the second tech and I paid the $75.. and he claimed to fix a leak in the a/c unit, but it is still leaking and the old coverings are still on the tube and then advised me that they would need for me to pay an additional $285.oo for antifreeze. He was here all of 20-30 mins...I think this is a scam to get money for coolant. No leak is repaired and this company charges hundreds of dollars to fill units with coolant...Beware..All of this will come to light. Review: I\'ve been paying for my contract with AHS for quite some time. I moved earlier in the year and contacted the company to change my address. I never had a need to use the service until recently my heat went out. I called to set up service only to find they had NEVER changed my address. I asked what happened, they said they saw my call but noted that I hung up, which was a complete lie. Had they said they forgot, I would have received that better than to say I hung up before everything was taken care of. I was transferred to Jacob, in customer retention who said he had taken care of it, issued a credit, changed the address and set up a service call for the following day. After waiting all day in the cold, I called again only to find out once again, my service was STILL at the old address and Jacob had not even placed the service call. I left him a message for a return call and got nothing. I called back today only to be told again, there was nothing put in the system and the address was still not changed, but a change request was put in and I was charged again for the change of address. This was after I was told it was credit back from the old account due to their error, then I was told I had to wait 48 hours for the address to update then I could call back in and make a service request. All of this in the middle of a cold front we are having. So instead of fixing the issue and making it right for me, they told me to wait in the cold. When I requested to cancel, I was told by the current representative that she could actually see Jacob sitting at his desk and offered to walk over and ask why the task was not completed. Well, this does me no good as I sit in my cold house trying to find a way to keep warm, while they figure out what is going on. I ended up having to call another service company out for the emergency, and it cost me an arm and a leg, exactly what I was trying to avoid by adding a warranty that covered the things in my home in just this such instance. THANKS FOR THE GREAT SERVICE AMERICAN HOME SHIELD AND SPECIAL THANKS TO JACOB IN RETENTION FOR ACTUALLY HELPING TO LOSE THE CUSTOMER HE WAS HOPING TO RETAIN. 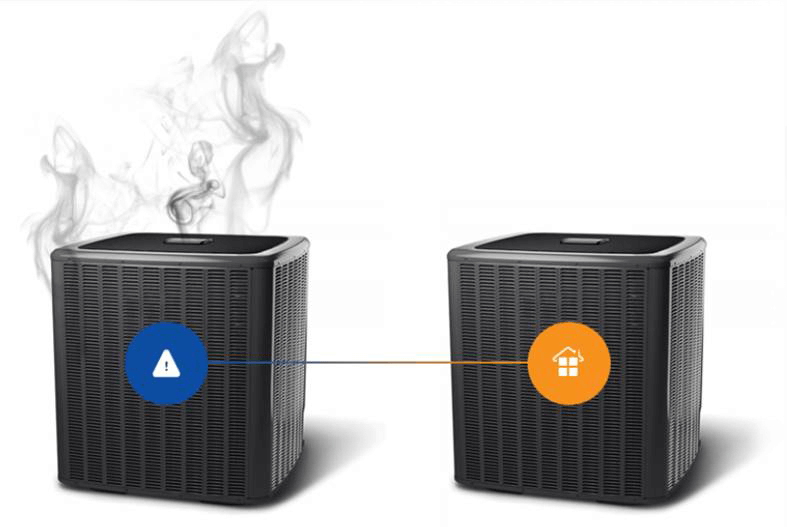 Review: Had problem with my AC blowing hot. Call American Home Shield to send a technician. Was called the next day by AC company. Time window is a little broad 8am-1pm for arrival or appointment time. However, service provider gave me a call to give me a 30 minute notice of his arrival. Was greeted by both technicians and they were very nice. Did not take them long to figure out the problem. They got my AC working again :). Review: I had my hot water heater go out and it would not stay lit. I called AHS and the girl that answered the phone was very pleasant, and she had a "can do" attitude. Within 2 hours I received a call from a technician, he set up an appointment for the next day . He was very nice, and knew exactly what the problem was, had the needed part in his truck, and it was fixed right away. I was very thankful I had AHS, it simplified everything..
Review: Great customer service and responds within 24 hours. Review: So today ( 8/29/17) will be the 8th time I have called Lowe\'s Appliance Repair...I have been dealing with an ice maker that won\'t make ice since April of this year..The first company they scheduled never showed, so looked up "reviews"..horrible. Called Lowe\'s to reschedule and while on the phone with them, looked up every repair company they tried to schedule me with...all have 1 star reviews. Finally, she finds a "five star" company. Very nice young man arrives..hooks up his computer to the fridge and says it\'s the deli drawer, Main UI and the main computer board. Deli and inside of fridge is nice and cool..no ice and not freezing in lower freezer drawer so I question that but he says this is the problem. Orders parts..comes back out and "fixes" it. Works for 6 weeks..no ice..freezer making horrible noise..Call Lowes again..they want to send out a 1 star repair person and I say no..they again send out the 5 star company. (I had to wait 3 weeks) Young service guy comes out and says we have a refrigeration leak. I said the symptoms are the same as before...so how come this is the problem now? Orders part. Different guy returns and seems to know what he\'s doing..(Hope springs eternal!!) Questions the leak part..adds some dye to the line and says he wants to come back in 3 weeks..leaves the "job" open so I don\'t have to go through Lowe\'s again and wait...During that time, ice maker makes enough ice for 2 glasses per day. He returns..looks at everything and now decides it\'s not a leak but the compressor! So how did you miss that the previous 3 times? "Sometimes, we overlook the simpliest things!" Really? Orders part..First young repairman comes back to install..All fixed! Yay! Ice in 24 hours! Yay! Oh wait...36 hours later...no ice..not a crumb...So I call them directly...Oh...have to call Lowes again to reschedule ANOTHER appt...Young repairman does call me..says..make sure lever is turned to on position in icemaker..I said..unless YOU turned it to the off position..it should be on! I check while he remains on the phone..I confirm it\'s on. He then tells me that I should turn off the breaker to the fridge..wait 10 minutes then switch back on. Nothing..no ice..So called Lowes today..I go through the entire 4 months of B.S. with young lady..who tells me that maybe after a full year of going through this...the repairman will declare its not repairable and they will give me a percentage of the fridge back. I paid 1900 on sale 3 years ago so I\'m guess that will be about 300 bucks MAX..Good news..the repairman can come out in two days...oh wait..repair company called and said..it\'ll be next week after Labor Day! Can\'t wait to see what the problem could possibly be! They fixed everything but what is broke!!! Lowes should be ashamed of the way they treat their customers. If they would hire QUALITY companies in every city that know what they were doing, they would actually have the admiration of the customer and SAVE money! Right now, this repair company has replaced very expensive, major components to this fridge and it\'s not repaired..all the while billing LOWES! I don\'t know how they stay in business..
Review: The contractor was very knowledgeable, and completed the job in a timely manner. The customer service individual, was efficient in obtaining a contractor expeditiously. Review: Customer service is excellent once you finally get off hold which generally takes up to 30 minutes or more. You really need to shorten your wait times. Also, the last claim the repairman said I would be notified by email and/or phone on the status of my replacement dishwasher. I was not notified and eventually had to call AHS to get the ball rolling on the replacement. Review: Their service technician contractors are unqualified, incompetent, and unprofessional. Review: I am pleased to say that I have not had any with AHS .Customer service was always helpful. Response from the vendor was timely and requested repairs were completed efficiently. The fee is minor in comparison to replacement of any item covered in the warranty. I would definitely recommend AHS to family and friends. Review: Our Garage Door Opener Belt was showing severe cracks, we were so afraid that it would break totally and hit our car or someone walking in. We called AHS and booked a service call.. The Tech that came out was very courteous and knowledgeable. He assessed the problem and told us we would need a whole new opener because ours was so old they could not get the parts.. He did have to make a return appointment to replace the opener. 2 days later our Opener was replaced.. We were very pleased with the contractor.. He was a very clean tidy individual and most courteous.. Thank you AHS.. We have been with you for 10 years and always very pleased..
Review: All you have to do is call and the agent tells you up front if you are covered and the job gets done (quickly).